Welcome to the CDC Theatre! We would love to host your rehearsals, rock concert, dance show, or performance. CDC has streamlined our process to make it easy for you to rent out the theatre to customize for your needs! Renting is going to be as easy as 1, 2, 3! Let us know what you want to rent the theatre for and we can let you know the payment options. Have with you proof of liability insurance of $1,000,000. Mail a refundable $100 Security Deposit 2 weeks prior to your event. Provide payment for your event on the day of. It can’t be that easy.....or can it? The theatre must be restored to its original state following the performance or event. Let us know the set up of the theatre you require. Tables and chairs? (110 People Max) Just chairs for a concert or performance? (250 Max) We will be glad to set it up! A walk through before you rent is required to rent the theatre. A lighting check, sound check, and general house walk through to see how things need to be restored. Any costs of damages will first deducted from your deposit, if the damages exceed your deposit an additional charge will be placed. In order to use the Sound/Lighting a CDC Representative must be present during the time of the event. Any properties or set found on the stage or back stage are the property of CDC and cannot be moved without approval of CDC. A CDC Rep may be on site while the theatre is in use. This way any help, questions, or issues can be addressed! 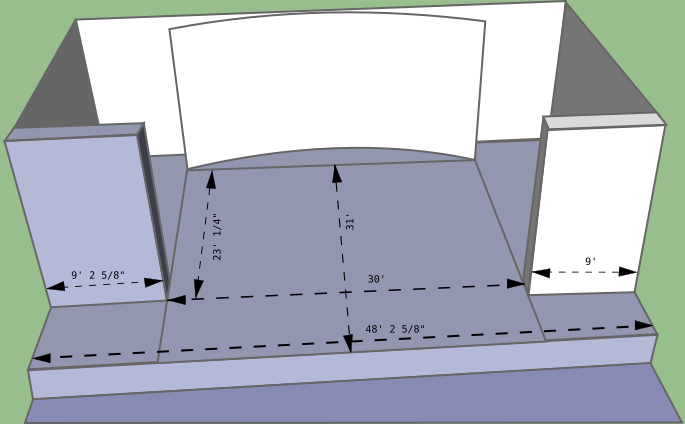 *Actual stage set up and dimensions vary depending on time of year and season show. This is good for rehearsals, auditions, small music rehearsals. A full rental of the theater, is great for concerts, original musicals, dance recitals, fully staged musicals. Note: For Tier 2/3 you receive a guaranteed minimum amount of time. (Tier 2 - 2 Hours, Tier 3 8 Hours). Those hours can be spread over varying days (provided availability by the CDC Calendar). Example a Tier 3 Renter could Use 4 Hours on a Friday Night and 4 Hours on a Saturday Night. Any additional hours would be billed according to Tier. While the theater is meant to be accessible and affordable and promotes a wide variety of artistic expression, management reserves the right to determine who may rent the venue and management's decision is final.